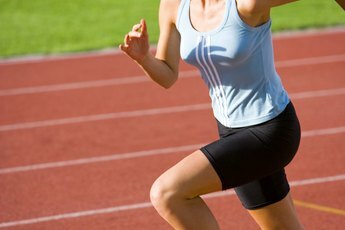 Many lower body muscles work in harmony to propel you down the track during sprints. Legendary American runner Steve Prefontaine once declared that "to give anything less than your best is to sacrifice the gift." That statement can apply on the track and in the weight room. If you want to perform at your best when sprinting, you should understand the primary muscles used. This will allow you to concentrate on strengthening these muscles and reaching your full potential as a sprinter. 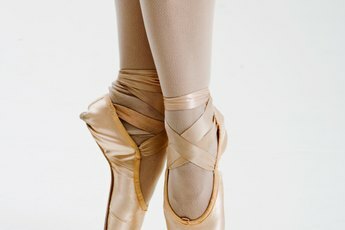 Your hamstrings are located on the back of your leg. This muscle group consists of the semimembranosus, semitendinosus and biceps femoris. Hamstrings are crucial for sprinting because they are involved in both hip extension and knee flexion, which occur every time you take a step. The hamstrings are known as fast-twitch muscles, which makes them well-suited to sprinting; fast-twitch muscles enable you to execute powerful movements. The muscles of your calves, the soleus and gastrocnemius, are both involved in sprinting. The gastrocnemius is the larger of the two muscles and assists in bending your knee. Additionally, the gastrocnemius as well as the soleus act to produce plantarflexion, which causes your foot to point away from your body. This movement occurs as you push off of the ground while sprinting. Like your hamstrings, the quadriceps is a group of muscles that work together to perform a movement. The muscles of your quadriceps -- the vastus medialis, vastus lateralis, vastus intermedius and rectus femoris -- are located on the front of your thigh and collaborate to produce hip flexion and knee extension. The muscles of your quadriceps are among the largest in your body and produce a significant amount of power for each of your strides. Your glutes -- the gluteus maximus, gluteus minimus and gluteus medius -- comprise your buttocks and help rotate and extend your thighs. Strengthening your glutes can help improve sprint performance and can also help stave off conditions such as runner's knee, low back pain and iliotibial band syndrome. Your abdominal muscles help you maintain your form by keeping your body stable and eliminating excess movement. Having strong abdominal muscles may help improve your speed and power. Additionally, your abdominal muscles influence your balance, which is important in races that require you to run on curved tracks. What Stretches Do Track Members Use Before Running?